Towards the end of 2011 it became obvious to the search team that some family members of the victims of the Puma 164 tragedy desired to visit the crash site in order to pay their last respects to their men, but did not have the wherewithal to undertake the trip. 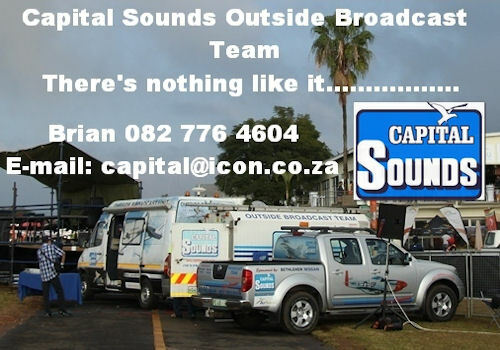 Rick van Malsen and Neill Jackson consequently decided that they would offer to lead a group of next of kin to the site during the July school holidays. Accordingly an e-mail was sent out to family members in January 2012, giving dates for the proposed trip and requesting commitments from interested parties. The initial response was nothing short of overwhelming and firm plans began to be formulated. 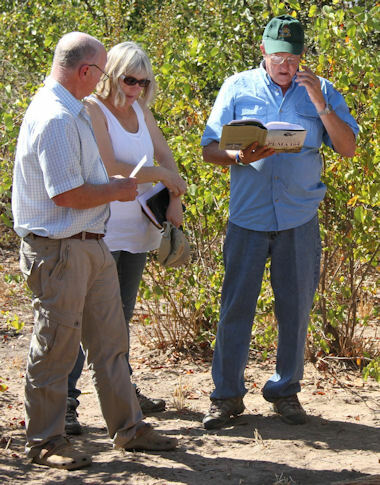 Contact had been made at the Johannesburg launch of The Search for Puma 164 with Sergio Pais Mamede, the son of Orlando Pais Mamede, the man who founded and built Mapai as a ranch headquarters, and Rui Morais, the grandson of Orlando Pais Mamede, and it was decided to invite these gentlemen to join the tour group in order to learn more about the history of Mapai. ·	Pat Osborne, mother of Puma 164 co-pilot Nigel Osborne, with her four adult daughters; Debbie Vaughan, Diann Bosch, Sally Rutter and Ingrid Elam. 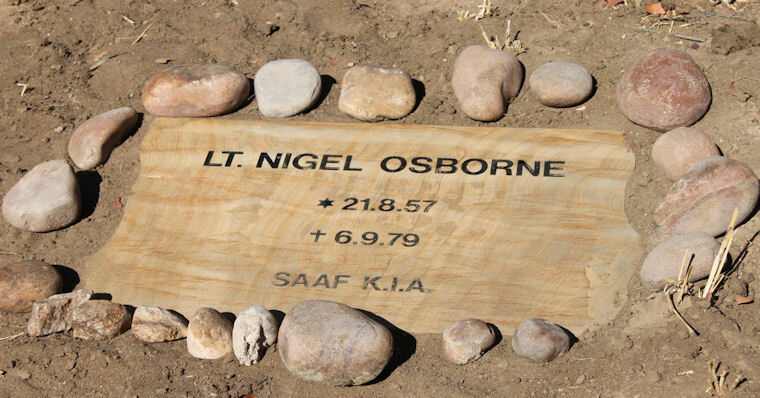 ·	The Osborne family were accompanied by Pat's brother; Colin Hart and his wife Joy, their daughter Angela and son Andrew, and Osborne cousins Mike Crooks and Graham Young. ·	Delia Forbes, sister-in-law of LeRoy Duberly and her husband Allan, who were on their second visit to the crash site. ·	Sergio Pais Mamede was going to be in Mozambique at the time and advised that he would meet us at the team base at Mamba Camp, in the Parc Nasionale do Limpopo near Mapai. 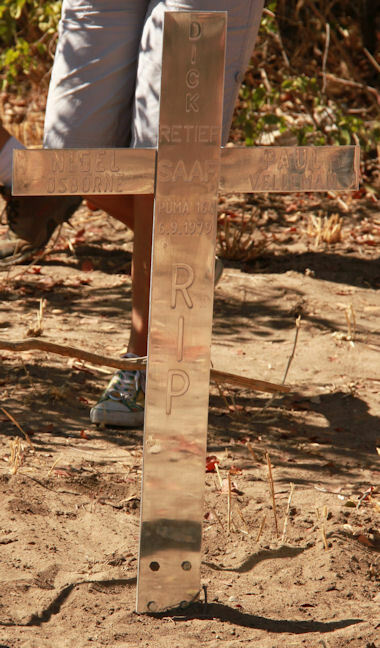 With the main group being made up predominantly of families of the SA Air Force men, it was decided to approach the SA Air Force Association to provide a cross to be erected at the smaller of the two graves at the crash site. 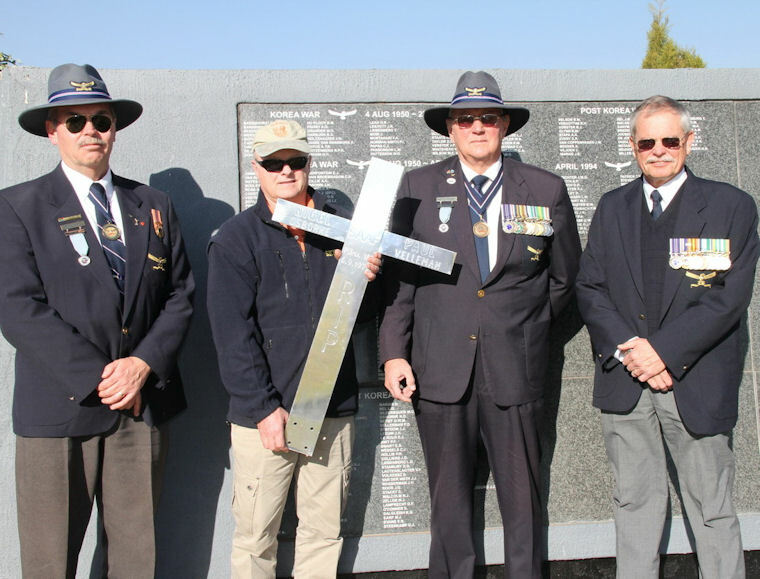 This was arranged by old friend and former Puma pilot Ola Grinaker and the cross was presented to Neill Jackson by Association members at the SAAF Memorial in Pretoria on Thursday 28 June. Left to Right: Philip Weyers, Immediate Past President, SAAFA; Neill Jackson; Brigadier General Neville Greyling, National President, SAAFA; Major General Hugh Paine, Vice Chairman of the Pretoria branch of SAAFA. 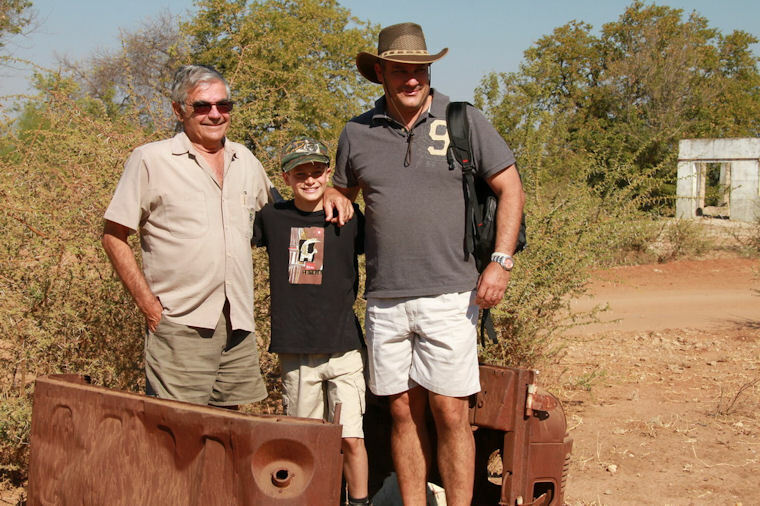 The van Malsens and Jacksons met up at Pafuri River Camp on the afternoon of Saturday 30 June and were joined just in time for dinner by Rui and Keith and their two hyperactive boys, having taken a long and circuitous route to Pafuri thanks to a mis-programmed GPS. The evening was spent getting to know each other and enjoying a good meal of rump steaks around the campfire. Early the next morning the team set off through the Kruger National Park for the border post at Pafuri, where the advantages of having a Portuguese-speaking Mozambican in the team became immediately obvious. Rui chatted at length to the border officials, most of whom knew of the Pais Mamede family and their accomplishments at Mapai, and our passage were expedited with the minimum of fuss. The 100-odd kilometre journey to Mamba Camp in the Parc Nasionale do Limpopo took approximately five hours, with the road conditions varying from rocky and rough to sandy and smooth. The scenery was magnificent, although devoid of any wild animals, and the group passed through a magnificent Fever Tree forest before coming across a huge baobab at which the Pais Mamede family traditionally stopped for a rest and a cold drink. Gabriel, the camp guard arranged by Sergio, was collected at the small village near the entrance to the National Park and the team passed through the park boom with minimal fuss, thanks once again to the linguistic efforts of Rui and the prior briefing of the rangers by Sergio, who had passed through some hours previously. The team arrived at Mamba Camp soon afterwards and tents and kitchens were set up while the boys collected wood and made an enormous campfire, destined to become a welcome feature of the next four evenings. 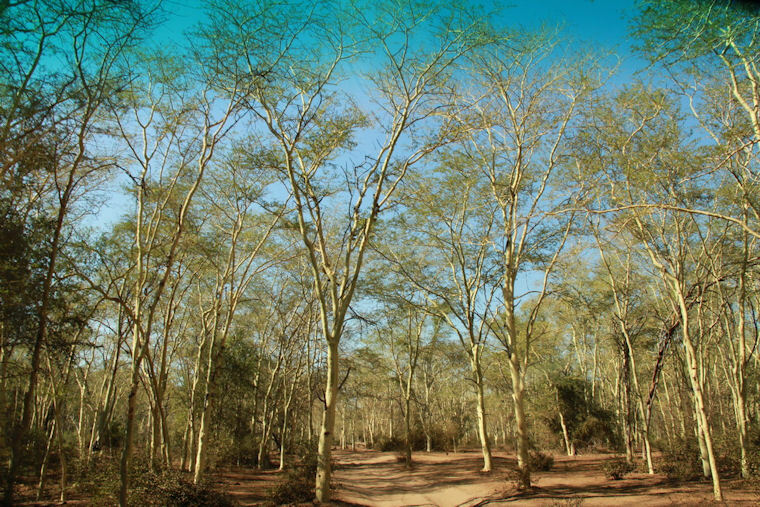 Mamba Camp is extremely isolated in beautiful lowveld scrub bush, with a dry pan next to the camp with adequate ablution facilities and piping hot showers. An old Lister diesel engine pumps water out of a borehole for the tank in the camp and also fills a small depression in the pan that nourishes the occasional visiting duiker and nyala. The following day Sergio led us all on a fascinating guided tour of the family's Ngala company headquarters at Mapai and explained how his father had carved a veritable empire out of the virgin African bush. Orlando had initially set up Mapai as a labour recruiting station for the gold mines in South Africa and then branched out to develop a vast business including cattle and game ranching, crop farming, safari hunting and the transport and distribution of supplies throughout Gaza Province. The village of Mapai grew up around the family headquarters and the Pais Mamede family provided electricity, water, schools, clinics, shops and bakeries for their 1000 plus employees and their families. 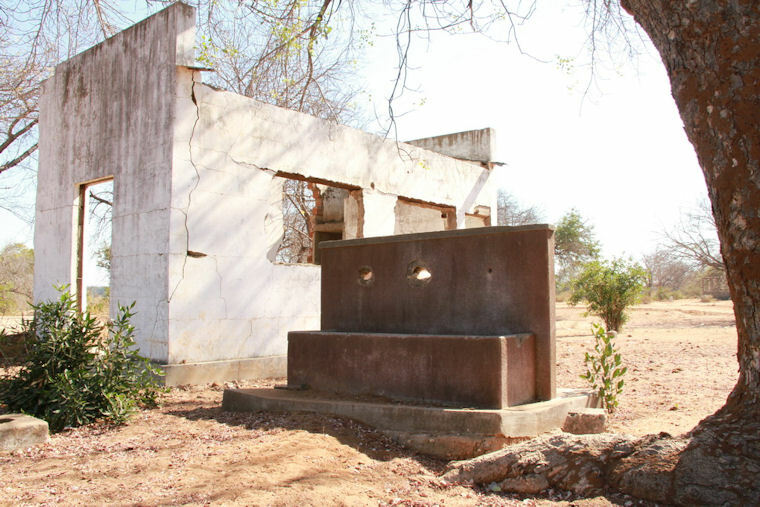 The family were ordered to leave Mapai in 1975 when Frelimo took over the buildings, livestock and vehicle fleets to set up a transit base for ZANLA insurgents. The nerve centre of Ngala HQ at Mapai; the office of Orlando Pais Mamede, with the first ever water point in the area visible in the foreground. 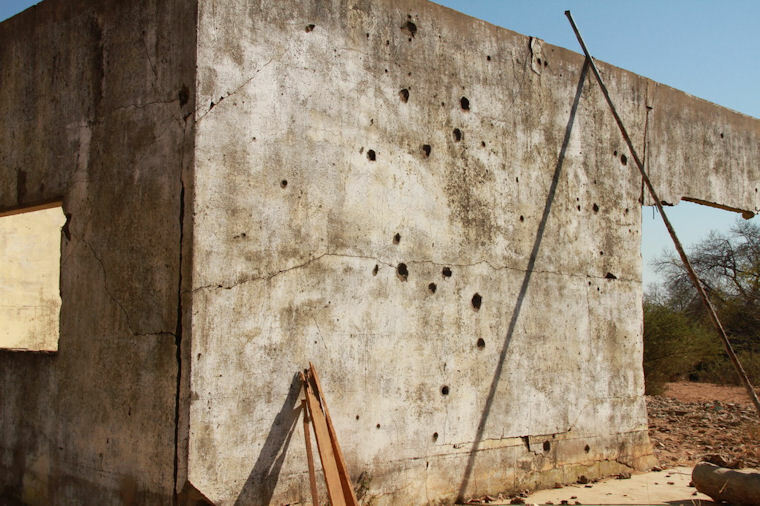 An office building at Mapai, clearly showing signs of damage from the battles for the town. 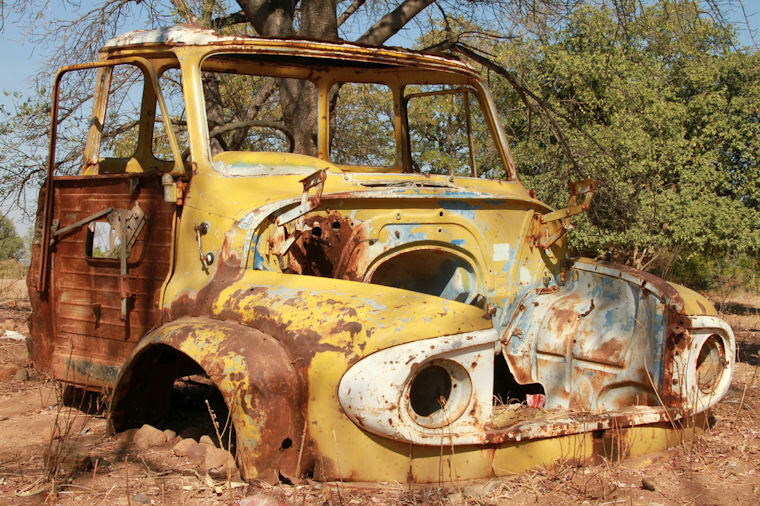 One of the Ngala company transport vehicles, taken over by Frelimo in 1975 and destroyed by Selous Scouts during Operation Long John in June 1976, along with a fleet of mostly new busses. 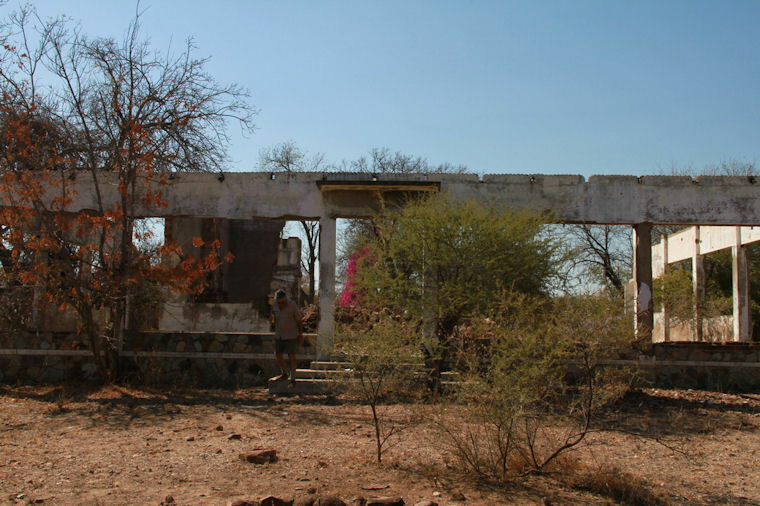 Sergio Pais Mamede shows Rick van Malsen the ruins of the Ngala company club at Mapai, used as a cinema to show films to the company employees and later used as an armoury by Frelimo. It is on the upper floor of this building where Jannie Nel was killed, Dale Collett seriously wounded and paralysed, and Tim Bax badly wounded, on 26 June, 1976, during Operation Long John. Miguel Morais and Connor Matthews follow closely behind, listening intently to every word. 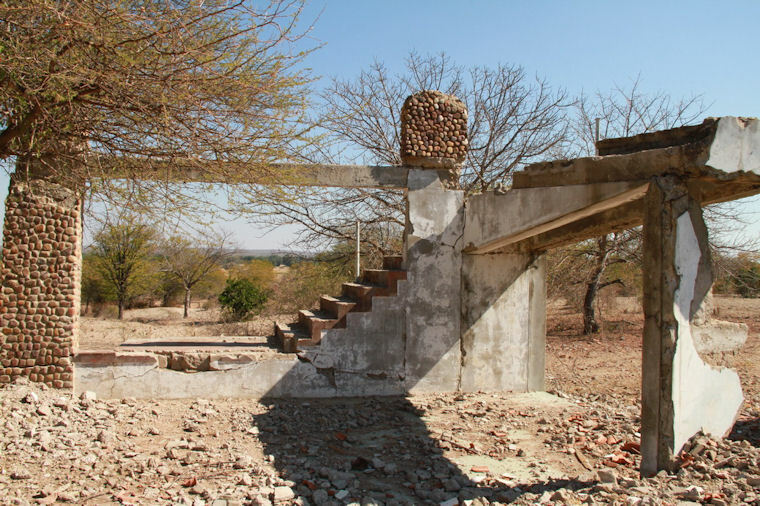 The ruins of Sergio's once-beautiful home, overlooking the Limpopo River, destroyed by Frelimo following the Selous Scout raids in 1976 (Operation Long John) and 1977(Operation Aztec). All that remains of the magnificent family home of Orlando Pais Mamede. Three generations stand together among the ruins of the family legacy; Sergio Pais Mamede, Miguel Morais and Rui Morais stand in the wrecked cab of one of the first Land Cruisers imported into Mozambique. Sergio's destroyed office building stands in the background. After a short trip into the town of Mapai, where Sergio arranged for a guide for the following day, the team returned to Mamba Camp, where the Velleman family had already arrived and set up their campsite. Another pleasant campfire evening ensued, as the group shared travel stories and became acquainted. The next day, Tuesday 03 July, the team collected Sergio's guide, Ernesto,from Mapai and set off to search for the last resting place of Ian Donaldson, David Hawkes and Rob Warraker, who were killed when their Canberra was shot down over Malvernia in January 1977. Reports had indicated that the men had been buried some distance away from the Canberra crash site, but this proved not to be the case. Ernesto led us to Malvernia, now known as Chicualacuala, and located an administration official who then directed the team to the village of an eye witness to the crash. This local villager took the team to the Canberra crash site, initially located by Bob Manser and his team in November 2008, and from his eye witness account it became evident to us that the three men did not survive the crash and that their remains had been cremated on site by Frelimo soldiers immediately afterwards. 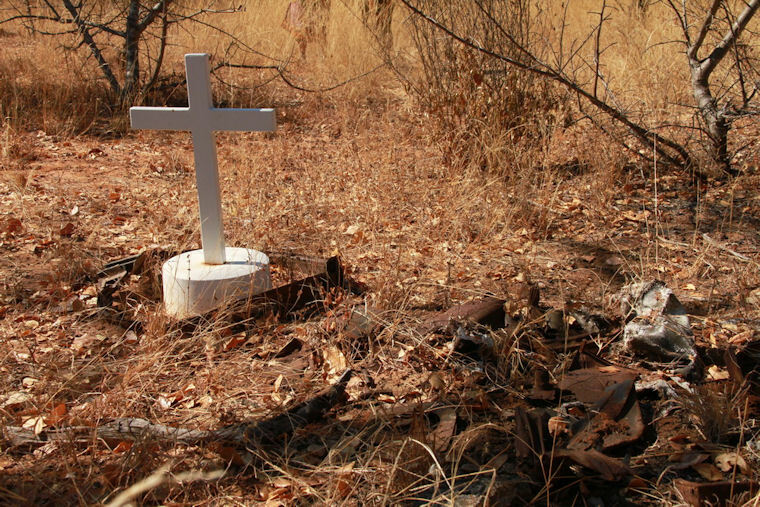 The last resting place of these three men is marked by a white metal cross that was erected on the crash site by Rick van Malsen's Puma search team in April 2009. The white metal cross, surrounded by debris from the destroyed Canberra, marking the last resting place of Ian Donaldson, David Hawkes and Rob Warraker. Satisfied that they had, beyond reasonable doubt, finally located the last resting place of the three men, the team returned to Mamba Camp, arriving shortly before sunset. Meanwhile, the Osborne famly had arrived en masse at the team base, amid much hilarity and teasing, as the inexperienced campers attempted to fathom the workings of their unfamilair loaned equipment. The Osbornes provided a breath of fresh air to the camp atmosphere and there was scarcely a moment that went by without someone bursting into raucous laughter. The four daughters even managed to bring an embarrassed blush to the face of the usually unflappable Sergio with their antics, some of which will be long remembered for the numerous animated re-tellings around the campfire. The following morning began well before sunrise, as the Osborne clan had all forgotten to turn off their alarms, set to wake them early for the long journey the day before. 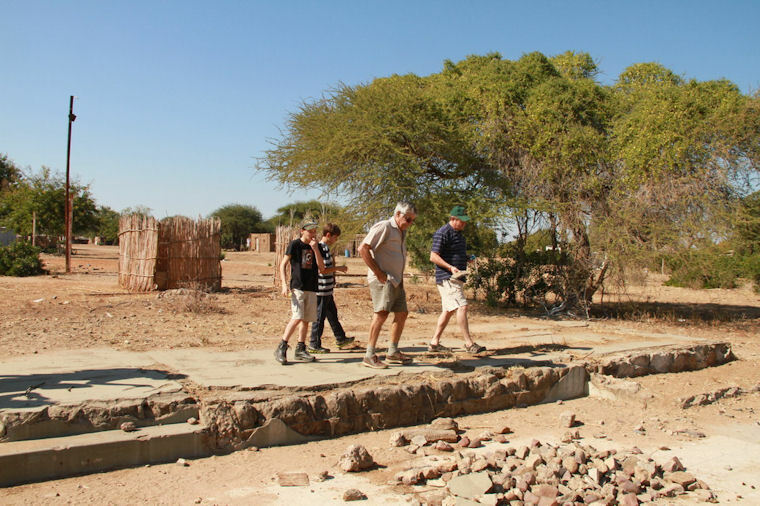 The entire group moved out of Mamba Camp on time, heading for the Puma crash site on the other side of Mapai, stopping in the middle of the drift over the Limpopo River for each member to pick up a large stone to take to the grave site, as per their early morning instructions. Briefly stopping at the Ngala headquarters for Sergio and Miguel to explain some of the intriguing famly history to the gathered families, the group soon arrived at their long awaited destination. Former Rhodesian Air Force pilot Ray Haakonsen had earlier been consulted by Neill Jackson regarding the format of a short service to be held at the graveside of the SAAF men. Ray had felt that the position of the Limpopo River between the team base camp at Mamba and the crash site where their loved ones lay, was very symbolic and suggested that the service be based upon the story of Joshua leading the Israelites across the Jordan River. He recommeded that the family members each collect a stone forom the river to place on the grave and that they also take something home from the site, albeit only a piece of metal, a handful of sand or a small stone. On arrival at the crash site the family members were shown the two graves and informed of the sequence of events that had unfolded on the morning of Thursday 06 September 1979. 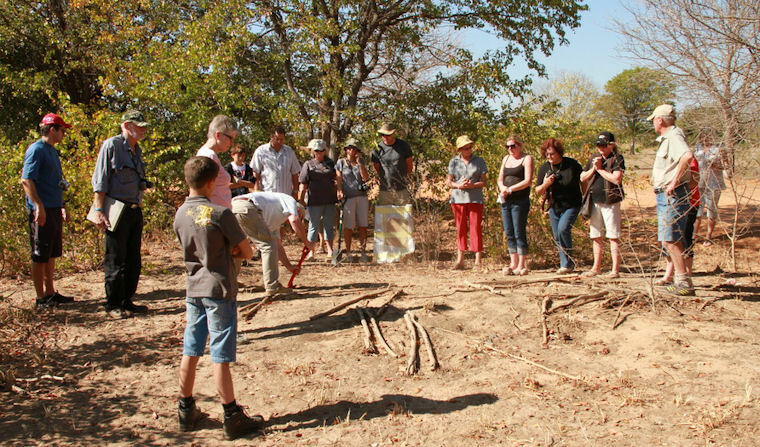 The menfolk then took turns digging in the hard clay soil to prepare a hole to place the SAAFA cross. 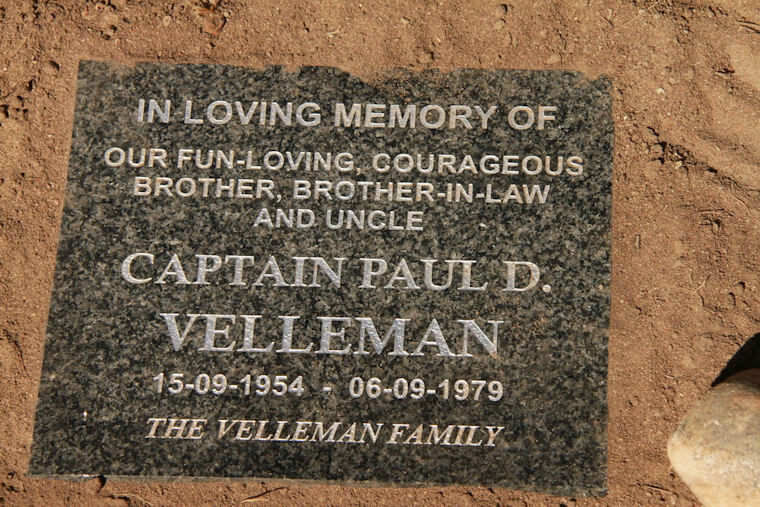 Two plaques were countersunkinto the top of the grave dedicated to Paul Velleman and Nigel Osborne, by their respective families. The family members then positioned their Limpopo River stones around the cross and the plaques and a short memorial service was conducted. Preparations for the placing of the SAAFA cross, with family members looking on. They remind us that the Jordan River stopped flowing when the Ark of the Lord's Covenant went across. Yea, though I walk through the valley of the shadow of death, I will fear no evil: for Thou art with me: Thy rod and Thy staff they comfort me. Thou preparest a table for me in the presence of mine enemies: Thou anointest my head with oil; my cup runneth over. Has long since fled us. Addressed to those who are still to come. On the force that drove our people. Of the world you live in. Lord, You were here on the day that Puma 164 was downed and these brave men lost their lives. We remember each one of them as we have called their Roll of Honour. You were with each one of them on that day . . . as you are here with us today. Thank you for that, thank you that they were not alone. Thank you that these families carry their memories in their hearts. You have brought us here today, each one with a specific purpose. Most to find closure . . . healing . . .peace . . .
And some to find new purpose. We ask for Your peace which passes all understanding. As we return home, please grant us travelling mercies. For thine is the kingdom, the power and the glory. After the service the family members were shown around the crash site and the nearby trench system, from where the fatal RPG-7 rocket was fired, and they collected small pieces of wreckage and artefacts to take home as mementoes.A small group of Frelimo officials and soldiers arrived to enquire what we were doing at the crash site, but after one of them phoned the District Administrator and was told that we were friends of Sergio, we were allowed to go on our way. The group were then led by Rui Morais to an old family hunting camp on the escarpment overlooking the Limpopo River, where a quiet, relaxed lunch was enjoyed by all, before returning to the team base at Mamba Camp for the last time. Rick van Malsen reading the Roll of Honour, flanked by Neill and Johanna Jackson. Early the next morning tents were dismantled and equipment packed up, again amid much hilarity from the Osborne clan, before the group split up and headed their separate ways; some further into Mozambique, some back to Botswana and the majority back to their homes in South Africa. All in all a most succesful trip, with all tasks fully accomplished: Much interesting history was learned about the origins of Mapai and the enormous positive influence of the Pais Mamede family in Gaza Province; the final resting place of the Donaldson Canberra crew was confirmed and peace and closure was finally attained by the Velleman and Osborne families; the SAAF Association cross was planted on the smaller grave and some great new friendships were forged. Our grateful thanks go out to all who accompanied us on this trip and contributed to making it such an enjoyable success, in particular Sergio Pais Mamede and Rui Morais; true sons of Africa.